Educational Toys and Games for Teachers, Therapists, Camp Counselors...and savvy Parents! StoryPlay Cards are an excellent tool for connecting kids and adults with the deeper, shyer part of their selves. This part is not only immensely creative but also vital for developing meaning and purposesomething that educators, therapists and trainers will find great value in as they seek to engage kids in a real way. Symbolic images have been used throughout timein books, movies and mythsbecause of their ability to tap into the deeper archetypes of life, including obstacles and allies, that speak to everyone on their journey in the world. 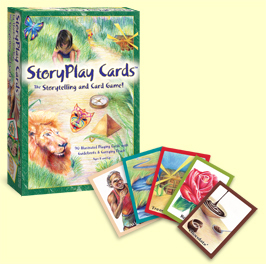 StoryPlay Cards allow you to have your own set of archetypal symbol cards. There are 88 "everyday symbols" from around our world in the deck (like Tree, Water, Path, Sword, Gift), plus two wild cards. They can be used in a variety of ways: storytelling, conversations that matter and even playing card games for fun. StoryPlay Cards were designed by and for educators to enable kids and adults to "stretch into another intelligence". » Learn more by downloading our PDF "StoryPlay Cards as Visual Prompts for Creativity". 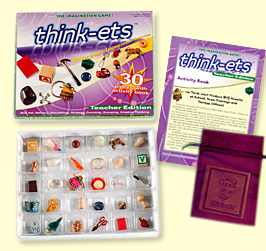 Think-ets® trinkets will bring a little excitement to your classroom. Use that enthusiasm to introduce concepts and reinforce the knowledge base and skills of your students. Think-ets Teacher Edition will fit into your classroom, home school, or after school programming and appeal to a wide range of ages and interests. This affordable "manipulative" offers lots of opportunities to make learning fascinating. Included lesson plans give you objectives and assessment options and are correlated to national standards. Each gives you a multi-stage activity with clear instructions you can follow closely or use as a springboard for developing your own lesson ideas. There are extension activities for students who want or need a little more experience with the concepts presented as well as enrichment for those who want to take the ideas further. A list of excellent resources to support the skills taught is at the end of each lesson. Looking for a great way to connect with campers or clients? Think-ets and StoryPlay Cards make for great tools for teambuilding and bringing out thoughts and feelings. They also make great camp games to play when it’s raining. They help students learn. Browse the stories on this site and you'll see it time and time again. When people sit down to a game, they fully engage their minds. Intellectually, socially, emotionally...there simply is no better way to engage a student's mind than through the use of a game. They're fun. Whether you love the thrill of competition, the challenge of an intriguing puzzle, or simply getting together with friends, there's a game out there for you. Bringing games into the classroom can help get kids looking forward to class, get them excited about learning. Sometimes, they even bring the games home, enriching their whole lives. They help break down barriers, and get students and teachers interacting on a whole new level. Here are just a few of the lessons and activities included in the Think-ets Teacher Edition. The activities in this lesson hone math, science and language arts skills as students recognize attributes and use them to categorize groups of trinkets. You’ll see critical thinking in action as they classify objects, then use graphs to represent the data they generate. Bar graphs and Venn diagrams are created in 3-dimensional formats. Then the data is depicted in paper formats. Get creative juices flowing with Think-ets to prime the pump! Students will select a set of trinkets and develop a story line that incorporates them. Watch how choosing the items and being able to play with them at one’s desk inspires children to write. An additional activity uses the trinkets to work on the important evaluation skill of ‘compare and contrast.’ Introduce analogies to extend the experience of comparison. Don’t think this review of grammar will bore your students! They’ll enjoy developing sentences that start with a tiny trinket noun and build from there. Try a game that gets kids moving to imprint the meanings of those pesky prepositions. And create your own classroom version of Mad-Libs, using Think-ets to fill in the blanks. Tiny objects will produce big results when you use them to enliven your lessons. Purchase a classroom pack online soon. And let us know how you like to use them in your classroom. Email info@think-a-lot.com to share your Think-ets successes. One of the best resources for using games in the classroom. Check it out! “We used Think-ets with the teachers on our professional development day with them just after we got them. The teachers really enjoyed them and commented that holding something made it easier to speak and having an object to relate to made it easier to find/create meaning in what they wanted to talk about." Copyright © 2008-2011 Think-A-Lot Toys. All Rights Reserved.